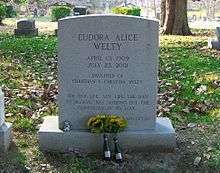 Eudora Alice Welty (April 13, 1909 – July 23, 2001) was an American short story writer and novelist who wrote about the American South. Her novel The Optimist's Daughter won the Pulitzer Prize in 1973. Welty was awarded the Presidential Medal of Freedom, among numerous awards including the Order of the South. She was the first living author to have her works published by the Library of America. Her house in Jackson, Mississippi has been designated as a National Historic Landmark and is open to the public as a house museum. 1 2 3 4 5 6 Johnston, Carol Ann. "Mississippi Writer's Page: Eudora Welty". MWP: University of Mississippi. Retrieved November 28, 2011. 1 2 "House". 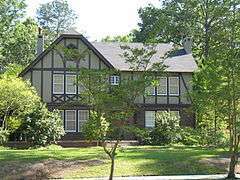 Eudora Welty Foundation. Retrieved November 28, 2011. 1 2 "Fiction". Past winners & finalists by category. The Pulitzer Prizes. Retrieved 2013-11-19. 1 2 3 "Welty Book is First Harvard U. Best Seller", Edwin McDowell, The New York Times, March 13, 1984, page C16. 1 2 Dawidoff, Nicholas. (August 10, 1995.) "At Home with Eudora Welty: Only the Typewriter Is Silent". The New York Times. Retrieved November 28, 2011. ↑ "Book of Members, 1780–2010: Chapter W" (PDF). American Academy of Arts and Sciences. Retrieved July 24, 2014. ↑ Thomas, Jo (1997-01-21). "For Inventor of Eudora, Great Fame, No Fortune". The New York Times. Retrieved 10 August 2014. Linda Kuehl (Fall 1972). "Eudora Welty, The Art of Fiction No. 47". The Paris Review.